We expect in Japan a total solar eclipse on the morning of May 21st. As I have no experience and special knowledge for this type of photo taking, I think the best way is to ask here the quick tips and mimimum equipment I should prepare. I just have cameras/lenses/tripods and no other related gears. The full eclipse of the sun can be observed in part of Fukushima pref. where I usually stay but ideally in a bit more southhern parts of Japan. so maybe I have to go to a vicinity of either Tokyo or Nagoya where I think I can buy a filter or two. Ian is absolutly right to warn of the dangers. In the old days of film, I used VERY strong filters even to compose sunset shots. I hated the "green spots" and was also very aware of the dangers that direct sunlight can have on the eyes. One of the huge advantages of an EVF to view these events. As we have switched over to digital TV in the UK, there ar lots of old small Analogue LCD TVs available on eBay. I use one as a 5" viewfinder by streaming the liveview signal to it. you can easily make a cheap solar filter using 'baader solar film', or you can purchase specialist solar filters. the one i use on my scope is made from baader film. do not be tempted to use 2 polarised filters at 90 deg to each other as they will not remove the harmful ir and uv rays that genuine solar filters will. similarly, using a piece of welding glass 'works' but the optical quality is very poor. there's annecdotal evidence that floppy disk material can be used, as can stacking negatives. when it comes to the sun though, you only get the one chance to get it wrong and you don't even feel any pain while the retina gets burnt (there's no pain receptors on the retina). when it comes to the sun, i'm fastidious in how i go about imaging it. i'm not sure if you are on the path of totality, however if you are, then the filters can be removed during the totality phase. this will allow you to capture the corona and also the diamond ring (just as totality starts / ends) where the suns rays shine between the mountains on the moon. i should add, that as long as you have a solar filter over the lens of the camera, looking through the viewfinder is absolutely fine. i do this with my scope with the magnification up at around 200x, but as the baader film has cut out 99.999% of the light, there is no problem. you should check the filter for defects first though. hold it up to the sun and if you can see any pinholes of light coming through, do NOT use it. if you really have no other option, tiny holes can be repaired with small pieces of pvc / tank tape placed over the hole, however the image will probably degrade a bit. don't forget to get yourself a pair of eclipse glasses. these are made from baader film, and will allow you to see the eclipse for yourself rather than on a camera screen / viewfinder. if you can't get a filter for the camera, an alternative is to project the image of the sun onto a white piece of card / paper and photograph that. there's enough stuff on the web describing how to do this. finally, while the sun is not fully covered, have a look at the shadows that are cast by objects around you that have holes in them - the gaps between leafs on trees, the holes in woven chair seats, a piece of card with numerous holes in it - and try to photo them if you can. it's worth it! Last edited by devilgas; 04-05-12 at 01:11 PM. ok, all the stuff about totality isn't relevant to you this time yoshi as the eclipse you'll see is annular (as per my photo above). you WILL need filtration throughout. Interesting - what is the difference between an annular and total eclipse? Which type was the one in 1999? It was spooky in 1999 - the birds did quieten down and it definitely felt cooler. a total eclipse is where the moon fully covers the sun. the one in '99 was a total eclipse. the one we saw in spain in '05 was annular, with about 4% of the sun still showing (as was the '99 one from my location) which meant it got colder, a bit darker and affected wildlife - the silence was quite surreal. why the difference in what the moon covers? simply down to orbital mechanics. the distance to the moon varies due to its orbit being elliptical and the fact it's inclined at about 5 deg to that of the earth. so when it is close to the earth, more of the sun gets covered. likewise, our orbit around the sun is also elliptical so the apparent size of the sun also changes depending on the orbital distance. Thanks a lot everybody for useful tips so far. It looks like there are many things I have to do before taking photographs. Atm I bought a magazine and am reading it. It starts how the eclipse occurs ... still long way to finish the reading. It looks like Tokyo is one of the ideal places for observation as it locates just under the central line of the eclipse belt. The link below shows how it would look like in Tokyo. The sun is quite small. Better to use both 24mm (i have no 28mm) and 200mm fixed focal lens? It is also interesting to note that Venus follows the sun. do you think ND400 would be ok? p.s. yes, it is annular solar eclipse. I did not know the difference until I read devilgas's comment. If ND400 is a neutral density filter, then NO. It will most likely not filter out the uv and ir that really do need to be filtered out. http://eclipse.gsfc.nasa.gov/SEgoogl...20Agoogle.html shows the exact ground track, and yes, Tokyo is bang on the central line. Plan the shots you want and the times between photos. I'd recommend photos every few seconds during the moon-fully-over-the-sun phase (termed 2nd & 3rd contact). If you do a wide angle shot and the sun creeps towards the edge, you can easily recompose and sort out the difference in post processing, but it's better to get it right to begin with. You NEED to get proper solar filters though yoshi. Uv will seriously screw your eyes up. Hi Dave, thanks a lot for the kind and useful advices. I decided to go to Aichi pref. and not Tokyo although that place I have in mind is not under the central line. It is however a wide parking lot at top of a mountain and as far as I remember there are no obstacles in the direction of east. I also prefer that I can pick up gears instantly from car depending on needs, which is probably not easy in Tokyo. Besides I can stay at a camping site from the previous day. 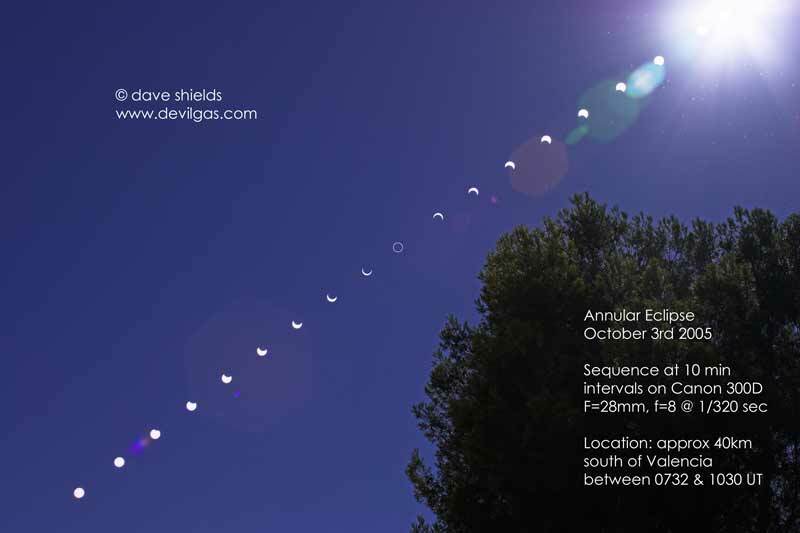 The annular eclipse time is however by around 30 sec. shorter there than in Tokyo. 4 min 30 sec. or so. Total eclipse time is approx. two hours. I will make a photo taking plan as I do not think I can think and determine what to do promptly on the spot. Meanwhile I bought a CF and three SDHC cards so that I do not have to worry about the memory capacity. All of them are 32GB. I still do not fully understand what a sun filter is. Will look for it in Tokyo when I stop over there. I also have in mind to use an old floppy disk sheet or DVD for compact cameras but not fully sure if it works properly. Shame we have here deep cloudy or rainy days for the past three days or so. As for lenses, I think I will use a zoom 350mm and extender x2 for tele purpose. When I used the combination last time for lunar eclipse I had difficulties in finding the moon in the frame as the moon was just upright and my camera (20D&7D) have no arituculated monitor screen. And the ball head, althogh its quite large, does not allow me to set up an exact framing with this heavy conmbination. About neutral density filter ND400, I understand UV is harmful to eyes. Is it however sufficiently dark for taking pictures of the sun? I'm thinking to use a live view of 7D. I will leave Fukushima in a few days to perform lots of odd jobs. Hope I can take some photos worth doing this all. it is worthwhile getting as close the the exact centre line as you can as you'll end up with a perfect doughnut image at the midpoint of the eclipse. moving away from the centreline will offset the inner ring accordingly. I also have in mind to use an old floppy disk sheet or DVD for compact cameras but not fully sure if it works properly. not something i've tried so can't offer an informed opinion, however most stuff i read say this is a 'bad idea'. you could always construct a sun finder and mount it to the flash socket. it's simply a hole in a piece of card that projects an image onto another piece of card mounted as a projection screen. get the sun centred in the camera viewfinder then quickly put some cross-hairs on the screen where the projected image of the sun falls on the 2nd bit of card. obviously, this won't work for the moon. but is great for lining up stuff on the sun - i use this principle to very quickly align my solar telescope. i wouldn't like to say. i don't know what damage would happen to the camera as the sensor will be subjected to strong UV and IR while you are doing live view. for the sake of a £15 (in the uk) piece of solar film and a mounting system (glued to a UV filter for instance), is it worth the risk? you've got the bonus of being close to solar maximum, so the chances of there being some large sunspots on show during the eclipse period is high. 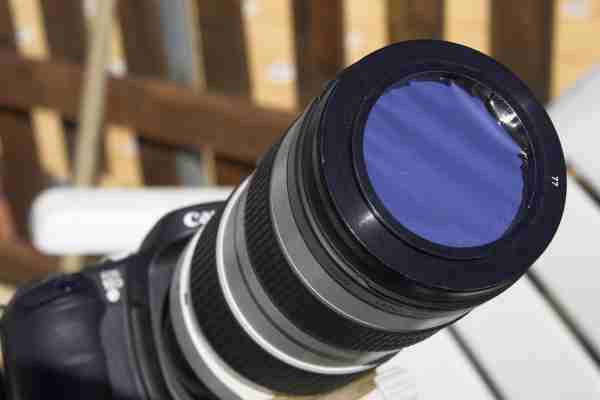 if you get your solar filters sorted out in good time, you can practice exposures etc on these beforehand. don't let the camera do the metering though. it'll probably hopelessly over-expose the shot. Many thanks for the informed advices. Taking into the advices into consideration, I placed orders for a sun film sheet (B5 size=25x18cm) and a ND100000 filter at amazon and expect to receive them tommorow. I'll cut the sheet so that it fits compact camera lens sizes and for 24mm lens. Instead of using two or a few ND400 filters in pairs, I finally chose to use a single ND100000 filter for an old 35-350mm zoom lens. I thought first that I can use ND400 filters for other normal shot purposes but decided to concentrate on the eclipse shots. The sun film sheet is not 100% effective against IR and the sun will be a bit redish. About the exposure setting. When AE does not work properly then I have to use Manual Exposure. f1/8, 1/320 sec. to 1/640 sec, ISO 200 would be a benchmark? OF course, I will make a slight adjustment on the spot. ND100000 reduces the sun light to 1/100000. No idea about the sun sheet. I looked it up and at the place I have in mind atm the eclipse would look like this. They say "umbral depth 61.8%" The center of the sun and the moon do not coincide, of course. Just for fun, the sun would look like this at the exact time of the day from the place currently I have in my mind. regret that no eclipse can be shown here.